De Decker, Klara. “Iconography of the Sea World on Late Hellenistic Bronze Vessels.” In Artistry in Bronze: The Greeks and Their Legacy (XIXth International Congress on Ancient Bronzes), edited by Jens M. Daehner, Kenneth Lapatin, and Ambra Spinelli. Los Angeles: J. Paul Getty Museum; Getty Conservation Institute, 2017. http:​//www.getty.edu​/publications​/artistryinbronze​/vessels​/27-dedecker​/. De Decker, Klara. “Iconography of the Sea World on Late Hellenistic Bronze Vessels.” Artistry in Bronze: The Greeks and Their Legacy (XIXth International Congress on Ancient Bronzes), edited by Jens M. Daehner et al., J. Paul Getty Museum, Getty Conservation Institute, 2017, www.getty.edu​/publications​/artistryinbronze​/vessels​/27-dedecker​/. Accessed D MMM. YYYY. Text by Jens M. Daehner, Kenneth Lapatin, Jeffrey Maish, Timothy Potts, Erik Risser, David Saunders, Ambra Spinelli, and Timothy P. Whalen © 2017 J. Paul Getty Trust. Text by Susanne Gänsicke and Stefan Hagel © Museum of Fine Arts, Boston, and Stefan Hagel. All other text © the authors. The text of this work and figs. 2.1, 2.3, 2.5–7, 5.1, 7.2, 7.5, 16.16–18, 23.3–4, 26.6, and 41.1–9 are licensed under a Creative Commons Attribution 4.0 International License. To view a copy of this license, visit http://creativecommons.org/licenses/by/4.0/. All other images are reproduced with the permission of the rights holders acknowledged in captions and are expressly excluded from the CC BY license covering the rest of this publication. These images may not be reproduced, copied, transmitted, or manipulated without consent from the owners, who reserve all rights. 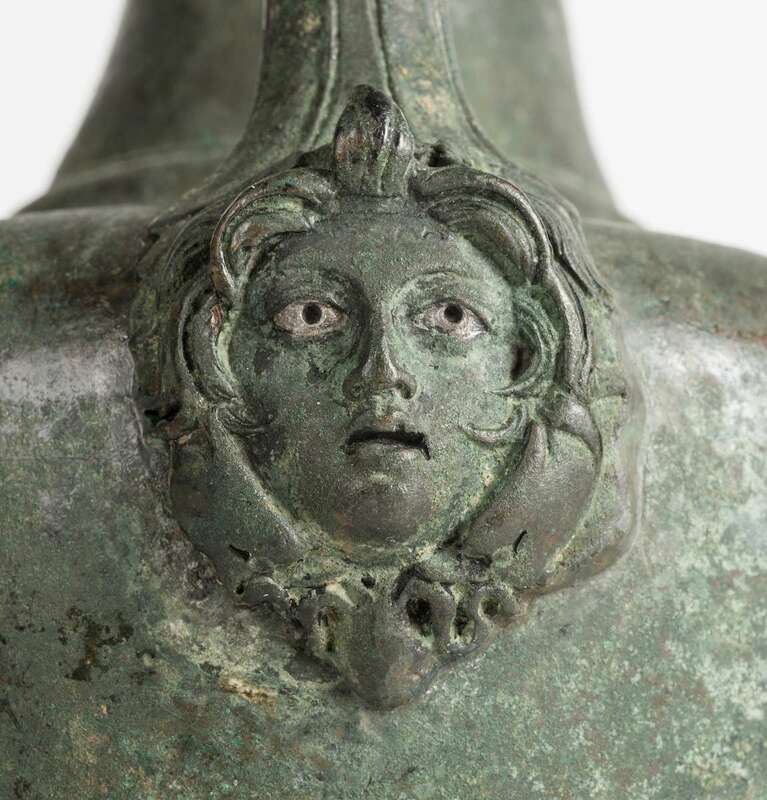 Our research focuses on the evolution of marine iconography in the Late Hellenistic period, as seen on bronze and silver vessels found along the Gulf of Naples. Representations of Triton, Scylla, and Medusa appear at times next to hippocampi, dogs, snakes, dolphins, and octopuses in high or low relief on the handles of various tableware. Compared to their canonical depictions, the deities here have lost their conventional attributes, which have become interchangeable. As part of Early Imperial propaganda, they acquire a new symbolic function, which differs from their original mythological meanings. The deities become ambiguous, more like generalized people with standardized marine features plus mixed or borrowed attributes. 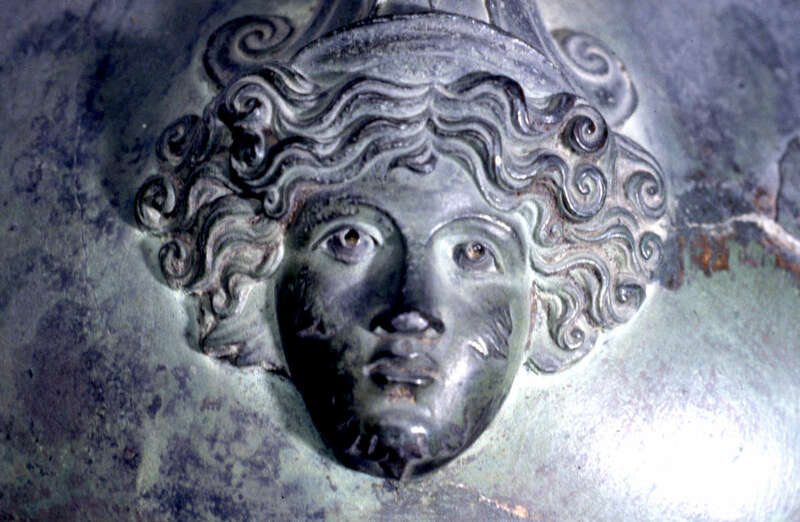 Good examples of this type of amalgamation are the Medusa with mussel and shell ears or the Scylla with seaweed on her face, both of which are attributes borrowed from Triton. Another important aspect is the quality of workmanship, which declined due to mass production and competition from cheaper imported vessels. 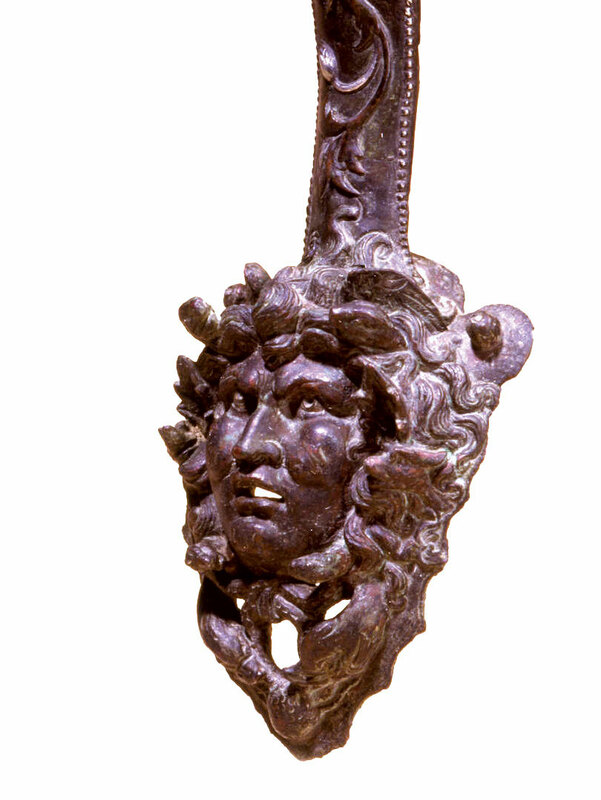 The sea themes are used particularly to decorate the handles; the lower attachment often ends with a face or figure of Medusa, Scylla, a Tritoness, or Triton, the faces of the latter two usually covered with kelp and seaweed. We will describe several such vessels, followed by a discussion of their significance. The handles of the Boscoreale krater are decorated in low relief, displaying acanthus leaves. It has simple, half-oval attachments. Its uniqueness lies in the fact that Triton is depicted as both male and female on the same vessel in high relief. The male face, unlike the female, is covered with seaweed, like the retreating waves; the female face, by contrast, is smooth and peaceful, like a calm sea. In the wavy hair (which they share), there are several snakes, and the ears are mussel-shaped. Under the chin is an octopus; along the face are two sea wolves with gaping mouths. The high relief is made with the utmost care and skill, its light-and-dark contrasts showing up particularly well among the locks of hair. The whole composition consists of a single block. This artifact shows great technical skill but does not use open-worked surfaces. Because of this, we suggest a date the end of the first century BC to the beginning of the first century AD. Handle fragments (lower attachment) from a calyx-krater, now in Geneva, were retrieved from Ostia (fig. 27.3).16 The length of the handle is 9.2 centimeters (3 ⅝ in.). It shows a male face in whose tousled hair two serpent heads writhe. The ears are again shaped like mussels, and seaweed clings above the eyebrows; the eyes, once glass or silver, are now lost. The face is covered with kelp; the mouth is slightly open. Two dogs are under his chin, and below that, two dolphins with an octopus between them. As to the iconography, several hypotheses have been advanced. Walther Fol thought it could represent Medusa;17 Waldemar Deonna suggested Scylla;18 and finally Christiane Dunant proposed that it might be a Triton or another sea god.19 The seaweed would be typical for Triton. One is immediately struck by the rather grim expression of the deity. Paired animal figures, like the dog heads and dolphins surrounding an octopus and placed symmetrically, are common motifs (see “The Two-Faced Triton” from Boscoreale). The workshop was likely in Campania or Capua, or in the East.20 Our estimated date for this handle fragment is post-Augustan to middle of the first century AD. The three works listed so far are in chronological order, the earliest being the Pompeian krater, followed by the Boscoreale krater, and finally this piece. Then we have two jugs with large mouths, again Type B 1222 and also in Naples, which were found in Pompeii in 1862.37 Their height is 41.5 centimeters (16 ¼ in.). The jugs are of high quality; the body color is verdigris, and the rim has two grooves. The horizontal part of the handle is flanked, left and right, by birds’ heads; in the center of the two attachments is a thumb rest in the form of a curved leaf, originally inlaid with silver. The transverse band consists of three rows of beads, dividing the horizontal and vertical parts. The vertical part of the handle is in low relief with a scroll of twisting leaves on the sides, edged again by a beaded pattern. The lower attachment depicts the face of a sea god; in his tousled hair are two ketoi, his face is covered with seaweed, and under his chin are two dolphins and an octopus in high relief, with silver inlay in the eyes.38 The composition of the Triton is entirely closed. This piece comes from the middle of the first century AD. One of the bigger jugs of Type B 1222 was found in the cubiculum of the Casa dell’Ara Massima in Pompeii; its height is 42.6 centimeters (16 ¾ in. ), including the handles (fig. 27.5).39 The jug’s rim has numerous grooves; the body is large, and its bottom consists of several concentric circles in high relief. The top of the handle depicts horizontal bird heads, rather plainly; the thumb rest in the center has thin leaves around it. The transverse band consists of three lines of beaded decoration; as is often the case, the silver inlay is missing. The vertical part of the handle has a cascade of leaves in low relief. The lower attachment is decorated with a vine leaf in the background, and Triton with his free-flowing hair has been placed over it. He has shell ears, but here the ears look more pointy than shell-like. His face is covered with seaweed. 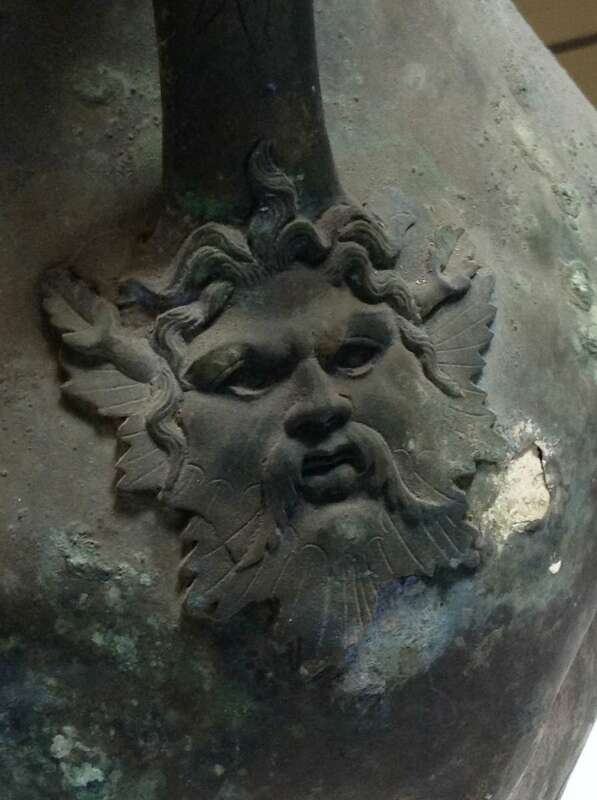 The iconographic significance is that the head of Triton now incorporates many Dionysian elements. The craftsmanship is of lower quality in comparison to the previously mentioned works and, again, the silver inlays in the eyes are missing. The composition is entirely closed. The piece looks very much like something mass-produced or made by an apprentice just learning his craft. The date of manufacture is the middle of the first century AD or somewhat later; the piece was probably produced in Alexandria, as indicated by the engraved leaves and the thumb rest with a crown of leaves. Still another jug, also belonging to Type B 1222, comes from Pompeii I 9.5, the House of the Orchard (Casa del frutteto).40 Its height is 37.2 centimeters (14 ½ in.) including the handles; the length of the handle alone is 21.5 centimeters (8 ½ in.). In line with the previous examples, its transverse band consists of three lines of beads, the silver inlay long ago eroded. The vertical part has a line of leaves in low relief; the surface has lost definition and become quite worn over time. The lower attachment is decorated with a male head in high relief, his wild wavy hair with a taenia on top with two wings; the forehead is covered with seaweed.41 The iconographic emphasis here shows once more how Triton appears with Dionysiac elements (e.g., the taenia), but his expression is severe. The composition is closed. Manufacturing date seems to be the middle of the first century AD or after, probably from a workshop at Alexandria but fashioned after a different model from the previous handle. It seems hardly coincidental that the sea world that artistically inspired the various maritime themes discussed here reflects the cultural, financial, and political issues affecting the human realm. It tells a story of artisans from the East looking for patrons who could afford what we call Hellenistic craftsmanship (fig. 27.6). Traveling across the Mediterranean to cities like Naples or Capua, artists set up their workshops close to their clients. It is highly probable that these artisans became specialized, becoming what we will now call Triton Masters (fig. 27.7). Most of the more ostentatious pieces were made in the mid-first century BC, like the kraters, in which the deities were shown in their traditional iconographical contexts. Even if we don’t know him by name, the master behind these works is recognizable; take, for instance, the highly detailed mussel-shaped ear of Triton (see figs. 27.2–5, 27.7). Then came a period from the late first century BC, when artifacts are complex open works in high relief, accentuated with silver inlays. This is where the archetypes become more ambiguous. Augustus’s naval victory at Actium in 31 BC became associated with the figure of Triton, and artisans added qualities of Triton to representations of other deities in support of Augustus’s political propaganda (fig. 27.8). This is also the phase when the pathos of Triton is most eloquently expressed. As prosperity increased in the Early Imperial period, lifestyles of the upper class became more lavish and elaborate. Higher demand during this phase—around the middle of the first century AD—caused an increased production and combined with the public’s interest in Alexandrian style to stimulate the next notable development in craftsmanship. The masters in charge began making tableware series using standardized techniques.42 It is also likely that they assigned much of the manufacturing to their apprentices, including many migrants from the East. This would explain why there is such a notable range of quality during this period. The distinctive mussel-ear shape inherited from previous masters devolves into pointed ears; even Triton’s pathos gets lost in the poor execution. 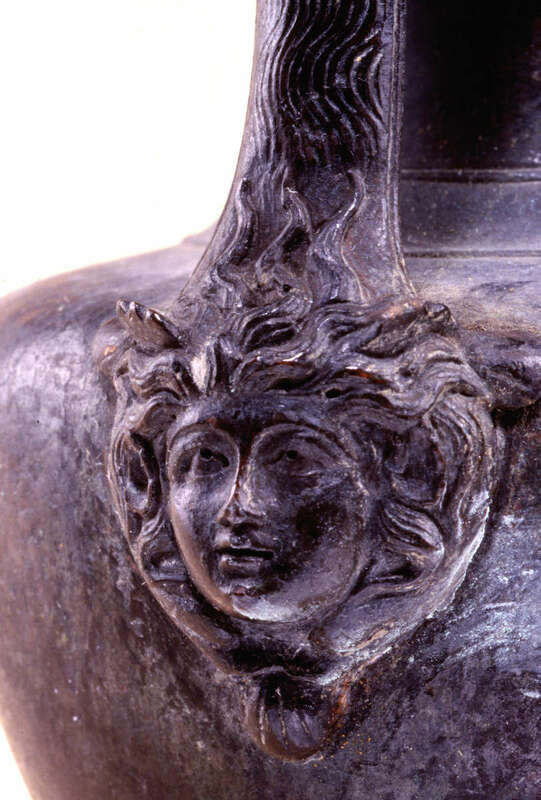 Finally, vessels produced during the last quarter of the first century AD feature a union between Triton and Dionysos. In doing so, the Triton Masters take this deity to his next transformation. Many thanks are due to S. Tassinari, S. Descamps, C. Pouzadoux, V. Sampaolo, A. Villone, F. Miele, A. Milanesi, G. Albano, D. Salzmann, R. Dylka, and J. Chamay. Andreae, B. 2003. Antike Bildmosaiken. Mainz: Philipp von Zabern. Andreae, B., S. Kansteiner, and M. Kunze. 2002. Meeresgott und Seepferd: Ein neuentdecktes Meisterwerk griechischer Bronzekunst aus Jerusalem. Exh. cat. Stendal, Winckelmann-Museum. Balty, J.-Ch. 1965. “Une anse d’aiguière d’époque romaine à incrustation d’argent.” BMusBrux 37: 13–77. Barr-Sharrar, B. 1993. 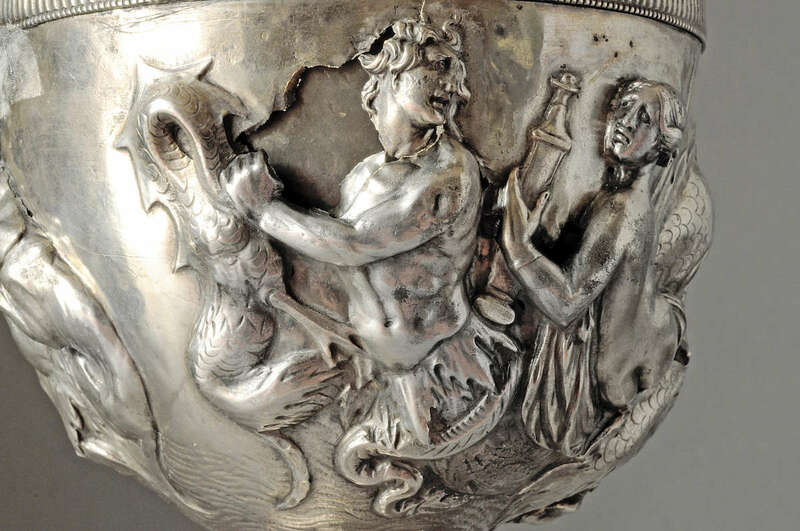 “A Silver Triton in the Getty Museum.” In Studia Varia from the J. Paul Getty Museum 1: 99–106. Malibu: J. Paul Getty Museum. Carandini, A. 1977. “Alcune forme bronzee conservate a Pompei e nel Museo Nazionale di Napoli.” In L’Instrumentum domesticum di Ercolano e Pompei nella prima età imperiale, ed. M. Annecchino et al. (Quaderni di cultura materiale 1), 163–68. Rome: L’Erma di Bretschneider. Dahy, I. 2005/2006. 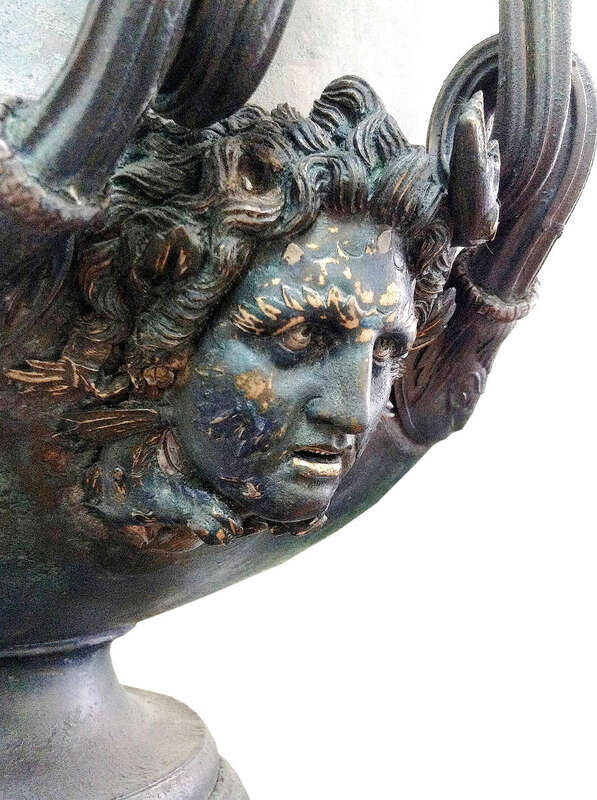 “La collection de bronzes du Musée de l’Arles et de la Provence antiques: Étude du mobilier issu de découvertes récentes.” Thesis, Université de Provence, Aix–Marseilles III. De Decker, K. 2007/2008. “Une olpé au Musée Hongrois des Beaux-Arts: La cruche de Budapest.” Boreas 30/31: 73–103. Deonna, W. 1912. “Bronzes du Musée de Genève.” RA 1912.2: 32–42. Di Cresce, A. 1995. “133 Brocche con imboccatura circolare: B 1240–1260.” Thesis, Università Federico II, Naples. Drexel, F. 1909. “Alexandrinische Silbergefässe der Kaiserzeit.” BJb 118: 176–235. Dunant, C. 1967. “Une applique de bronze en relief.” In Gestalt und Geschichte: Festschrift Karl Schefold zu seinem 60. Geburtstag am 26. Januar 1965 (Beihefte zur AK 4), ed. M. Rohde-Liegle, 110–14. Bern: Francke. Dunbabin, K. M. D. 2003. The Roman Banquet: Images of Conviviality. Cambridge: Cambridge University Press. Faider-Feytmans, G. M. 1979. Les bronzes romains de Belgique. Mainz: Philipp von Zabern. Fol, W. 1874. Catalogue du Musée Fol: Antiquités. Vol. 1: Céramique et plastique. Geneva: H. Georg Cherbulier. J. Paul Getty Museum. 1994. 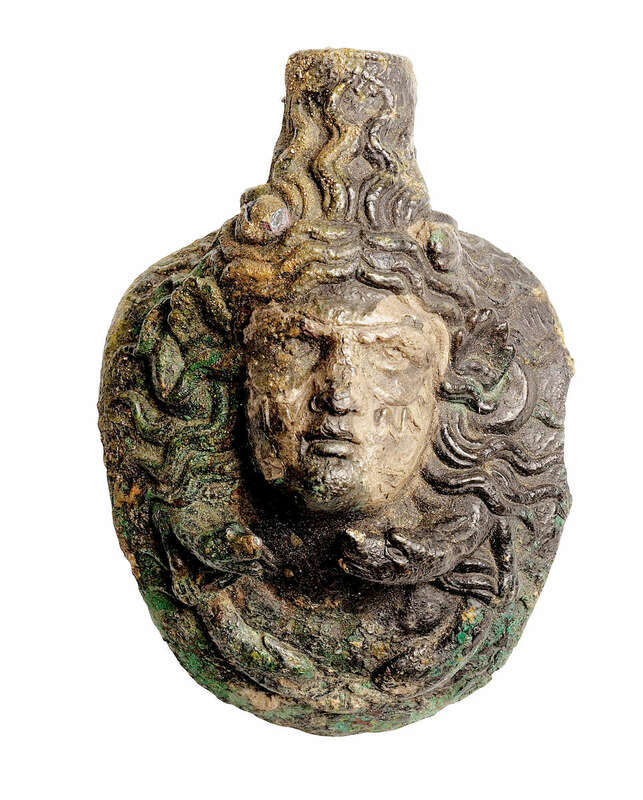 A Passion for Antiquities: Ancient Art from the Collection of Barbara and Lawrence Fleischman. Malibu: J. Paul Getty Museum in association with the Cleveland Museum of Art. Guzzo, P. G. 1980. “Argenteria da Palmi in ripostiglio del I sec a C.” AttiMGrecia 18–20 (1977–79): 193–209. Rome: La Società. Guzzo, P. G. 2006. Argenti a Pompei. Verona: Electa Milano. Mielsch, H., and B. Niemeyer. 2001. Römisches Silber aus Ägypten in Berlin. Winckelmannsprogramm der archäologischen Gesellschaft zu Berlin 139/140. Berlin: Walter de Gruyter. Nuber, H. U. 1972. Kanne und Griffschale: ihr Gebrauch im täglichen Leben und die Beigabe in Gräbern der römischen Kaiserzeit. Berlin: de Gruyter. Oettel, A. 1990. Bronzen aus Boscoreale in Berlin. Berlin: Antikenmuseum. Oliver, A., Jr. 1977. Silver for the Gods: 800 Years of Greek and Roman Silver Exh. cat. Toledo (OH), Museum of Art. Oliver, A., Jr. 1980. “A Set of Ancient Silverware in the Getty Museum.” GettyMusJ 8: 155–66. Pernice, E. 1925. Die hellenistische Kunst in Pompeji. Vol. 4. Gefässe und Geräte aus Bronze. Berlin and Leipzig: Walter de Gruyter. Pernice, E., and F. Winter, eds. 1901. Der Hildesheimer Silberfund. Berlin: Spemann. Petit, J. 1980. Bronzes antiques de la Collection Dutuit: Grecs, hellénistiques, romains et de l’Antiquité tardive. Paris: Musée du Petit Palais. Pirzio Biroli Stefanelli, L. 1990. Il Bronzo dei Romani: Arredo e suppellettile. Rome: L’Erma di Bretschneider. Ratković, D. 2005. Roman Bronze Vessels in the Roman Collection of the National Museum in Belgrade. Belgrade: Narodni Muzej. Riederer, J. 2001. “Die Berliner Datenbank von Metallanalysen kulturgeschichtlicher Objekte III: Römische Objekte.” Berliner Beiträge zur Archäometrie 18: 139–259. Riz, A. E. 1990. Bronzegefässe in der römsich-pompejanischen Wandmalerei. Mainz: Philipp von Zabern. Sarnataro, T. 1998. “138 Paterae.” Thesis, Università Federico II, Naples. Stefani, G. 2005. Cibi e sapori a Pompei e dintorni. Exh. cat. Pompeii, Antiquarium di Boscoreale. Pompeii: Edizioni Flavius. Tassinari, S. 1975. “Pot à anse unique: Étude du décor des anses d’un type de récipients en bronze d’Herculanum et de Pompéi.” CronPomp 1: 160–231. Tassinari, S. 1993. Il vasellame bronzeo di Pompei. 2 vols. Rome: L’Erma di Bretschneider. Tassinari, S. 2002. “Observations et propos sur la fabrication des anses de récipients de Pompéi.” In I Bronzi Antichi: Produzione e tecnologia: Atti del XV Congresso Internazionale sui Bronzi Antichi organizzato dall’Università di Udine, sede Gorizia Grado-Aquileia, 22–26 maggio 2001, ed. A. Giumlia-Mair, 363–69. Montagnac: Monique Mergoil. Tassinari, S. 2009. Vasi in bronzo, brocche, askoi, vasi a paniere. Naples: Electa. Tassinari, S. 2015. “De la spécificité typologique du décor des anses: L’exemple de la catégorie des cruches trilobées D.” In New Research on Ancient Bronzes: Acta of the XVIIIth International Congress on Ancient Bronzes, ed. E. Deschler-Erb and P. Della Casa, 235–39. Zürich: Chronos. Trofimova, A., ed. 2007. Greeks on the Black Sea: Ancient Art from the Hermitage. Exh. cat. J. Paul Getty Museum: Los Angeles.